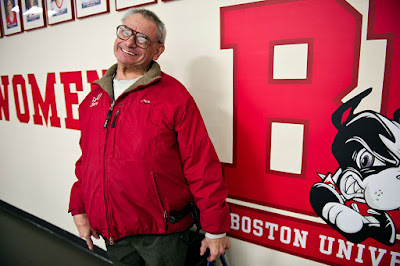 We’re sharing a letter sent to BU athletics alumni by former Terrier Head Coach Jack Parker encouraging contributions to the GoFundMe account created to support Elliot Driben, the 73-year-old BU superfan, affectionately known as “the Mayor of Terrier Nation.” We invite our readers to lend a hand to one of the truly good guys. Our friend and erstwhile “Greatest Terrier Fan” Elliot Driben is in an assisted living facility in Evans Park. He is struggling in a number of ways, one of which is financially. He needs our help. Elliot probably gave a larger percentage of his income to BU Athletic teams than anyone—ever. And he did it every year for over forty years. He touched every athlete’s life, so I am hoping we can help him in his time of need. Any amount you can contribute will be appreciated and will help keep Elliot safe and secure. He deserves at least that after all he has done for the rest of us. The GoFundMe link is: https://www.gofundme.com/elliot-dribens-care. Former Terrier standout Jason Lawrence is the new head coach of the Wakefield High School boys hockey team. 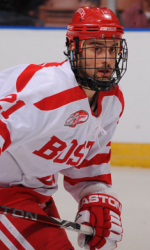 Lawrence was the top goal scorer with 25 on BU's 2009 national championship team and had 97 points as a Terrier.